This is a historical novel set in the late 1800’s. Timothy Wilde is a bartender until the bar he works at along with downtown Manhattan goes up in flames. The fire leaves him scarred, homeless and penniless, his dreams for the future up in smoke. His brother obtains him a job as a police officer, a brand new police force, because he has no other work he can do he becomes a ‘copper star’. Walking home after a rather vexing day, he runs into, or rather is run into by a little girl who is covered in blood. After taking her home and cleaning her up, Timothy discovers it is not her blood, here the mystery begins. Timothy has to fight to investigate this mystery to the finish. The story is written in the first person, from the view of Timothy Wilde, very well written considering he was orphaned at 10 and therefore had no formal education that we know of beyond that aside from reading the Herold daily. Despite that this is a smartly written mystery that follows a well defined plot-line, and yes there is a twist and a realistic ending, in that not everything is wrapped up neat and tidy. According to my friend, who is sort of a NYC history buff, the names and descriptions of the city are historically accurate however I did find one mistake. 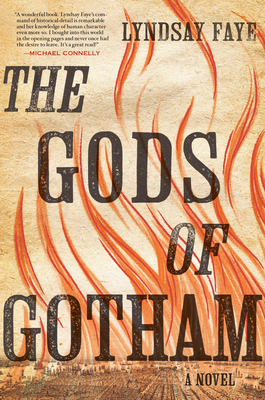 In the prologue, when Timothy describes the fire that made him an orphan he states that in “In October 1826, in the hamlet of Greenwich Village, a fire broke out in a stable flush adjacent to the home of ….. the conflagration spread to the main house by means of a kerosene explosion.” The only problem being that Kerosene wasn’t invented until 1846 by Abraham Gesner, a Canadian, Kerosene wasn’t available in the US until 1854. Sorry Lyndsay. This in no way detracted from my enjoyment of this book, still a smartly written enjoyable story. Posted by Belleza on March 10, 2013 in 2013, Crime Fiction, Historical Fiction and tagged Library Book, Liked it ♥, Lyndsay Faye, Mystery, New York City, NYPD, Recommended to read.